Kobo and Amazon are in a neck to neck race to open an ebookstore in South America's largest market. There's been furious speculation about which would be the first to tap one of the single largest unexploited ebook market, and today I finally learned the answer. Apple beat both their larger and smaller competitor to the punch. 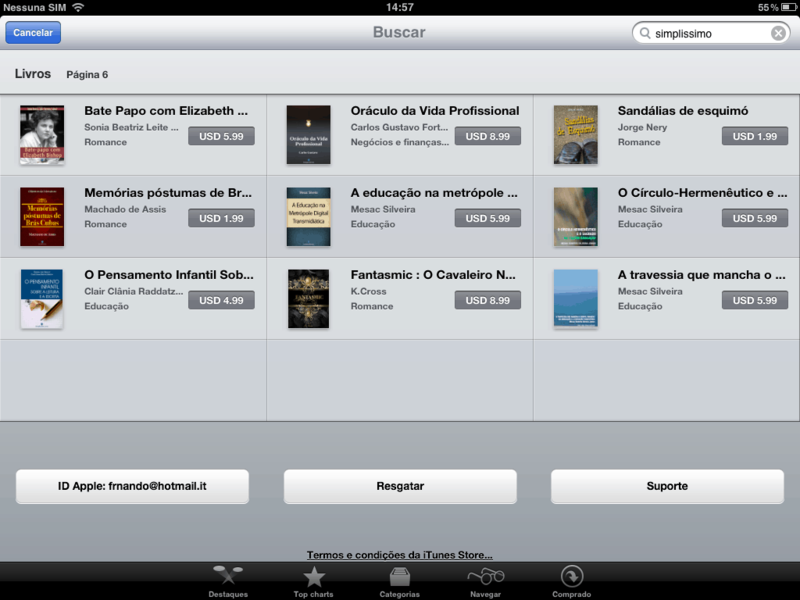 Early reports are coming in from a Brazilian ebook blog that they are now able to buy ebooks from Apple (they could only download free ebooks before). What's more, there are signs that iBooks is now open to most of South and Central America, including 17 countries from Mexico to Chile. My source notes that the only country notably not on the list is Uruguay. As you can see, prices are in US dollars. I'm told that the selection includes ebooks from DLD, one of Brazil's larger ebook distributors, but other than that I can't offer any info about the selection. While this launch was hinted at in a rumor last week, I have to say that I am surprised at how thoroughly Apple managed to beat Amazon. Apple was the first to launch in not one but 2 of the last unexploited ebook markets. Between the Spanish and Portuguese speaking populations, Latin America and South America account for over half a billion people. While some might write them off as being to poor to buy ebooks, that is still one heck of a lot of people. That's why Amazon has been working towards launching in South America. They've hinted at a launch in Chile in November of 2011, and are also rumored to be launching in Brazil next month. I just check the iTunes store here in Mexico, both desktop and iPhone, and can confirm that the catalogue is now available and you can buy ebooks. The front page is still the same (free public domain books) but the categories and the search reveals paid books and authors. So maybe they are in some kind of beta testing. I check my own ebook (distributed by Smashwords) and download a sample. Now I can promote it with friends, blog readers and family. We are just waiting for amazon.mx. This is just another stupid market shout, Apple don’t open a Brazilian store, but give access to your US store to Brazilians, before, they have to lie, using an US Address. And the prices, a bad joke: A song of ice and fire Book I Apple Brazilian price: U$19,00 Amazon price: U$8,99- Book III Apple price: U$23,00, Amazon price: U$8,99. Why Brazilian translations are much more expensive? On an average Brazilians have a medium income seven times smaller than US citizens. Brazilians still needs to use a international credit card for purchase, that’s a card Brazilians don’t average have. This is not apple brazilian store, is worst than Amazon, that at least, still sell to Brazil from a long time. I have bought many books from the apple store without any problem,. Today I tried to buy one more, and got the message saying that my account has to be transferred to the brasilian store. How can I do that. ?